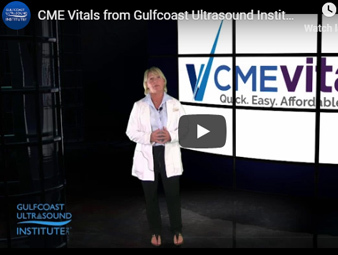 Gulfcoast Ultrasound Institute is pleased to offer CME Vitals! The affordable online solution to quickly earn the CME credits you need. CME Vitals offer you engaging activities in an interactive online learning format which you can complete on your own schedule. Approved for AMA PRA CAT I Credit™. Accessible with any internet enabled device. Purchase individually or save money by selecting a Volume. Interactive format via: Videos, Images, Case Studies, Quizzes and more! and stay ahead of schedule. Consistent flow of newly releasing Vitals. Have a group? Save more with group discount pricing. Call (727) 363-4500 for details!